Sometimes it seems that one can work endlessly and when all is said and done it doesn’t look like much was accomplished. This week was one of those times. The design for this week’s Building Blocks Quilt Along was “Circuit Board”. It’s a really nice design and someday I’ll have the courage to use it on one of my quilts. Maybe. The problem is that I have always had difficulty stitching this design. It takes monumental planning to make all those lines flow and align correctly. I tried and tried to figure out how to do this without marking, and what a disaster. After spending a great deal of time with a practice fat quarter, I just marked my block in the various scales and followed the lines. The one-eighth part of the block (out of necessity) was free hand, but size is on my side there. You can’t see the flaws. Anyway, it’s finished and I’m satisfied. I found the series in quilting scales very useful. This Monday we move on to a set of new blocks. In the meantime, I was determined to finish my April 2013 Sugar Block Club block, cut out the block for May 2013 and May 2014 block when it became available. Well, I cut and pieced all three! Wow! It’s the third of May and I have my May blocks done. They are all paper-pieced, and I think I’m improving! As mentioned before in an earlier blog, I’m doing two each of these blocks. I will have a monster quilt by the time next December rolls around and am toying with the idea of going back to the beginning of the year and quilting each block individually and then attaching them. Not having any experience with this, does anyone know if that would be easier than quilting it as one big quilt top on my domestic machine? I’ve done a queen-sized quilt before, but I have a feeling that with sashing and border, this quilt is going to be larger than a queen. I love it when Leah Day posts a new fmq design. This week it was #433 Growing Sprouts. I tried it, and had a lot of fun learning it. I’ve been saving all my little samples and when I have to do a quilt, I go back through the growing stack, or even look at my quilt sampler that I did in Leah’s Craftsy class. How fortunate we are to have all Leah’s tutorials at our fingertips on the internet and in her books. Talk about a great resource! Thank you Leah! In the coming week I want to get the quilt cut that I planned on doing this past week. I also will have to begin the fmq on the two philanthropy quilts I have committed to complete. I guess I finished more than I realized this week! 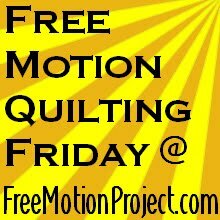 I’m linking up with Leah Day’s Free Motion Project Link Up.